The CCGS Louis St. Laurent ,the Coast Guards second oldest ship, and one of 2 heavy icebreakers arrived in port Monday. On Arrival, she topped up the tanks at the Irving Oil Wharf. and then moved to the basin off BIO, before tieing up at Pier 9 Tuesday morning. Formerly based in Halifax, the ship was moved to St. John’s Newfoundland. 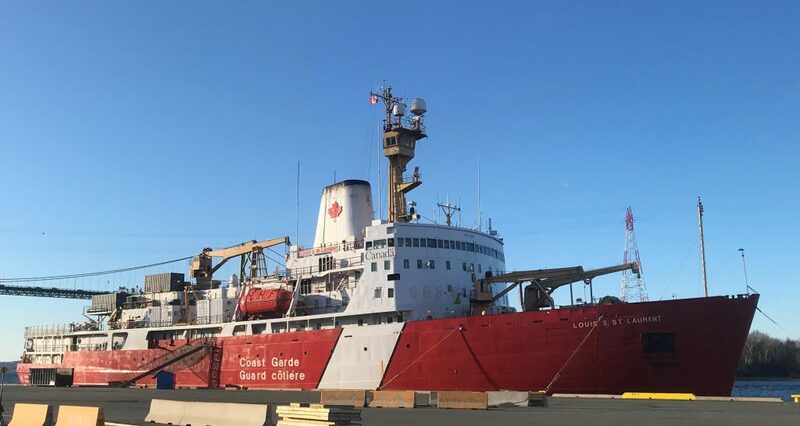 The ship is likely here for Supplies and crew change, but given the proximity to the end of the federal fiscal year, may be on some budget maximization exercise until April 1.
edit – yah i know, i had the other Saint John. This entry was posted in CCGS, pier9 on March 20, 2019 by Peter.